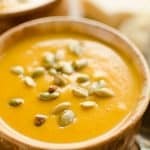 Pressure Cooker Creamy Butternut Squash Soup is a healthy and hearty recipe made in your Instant Pot for a quick and easy 20 minute dinner idea. 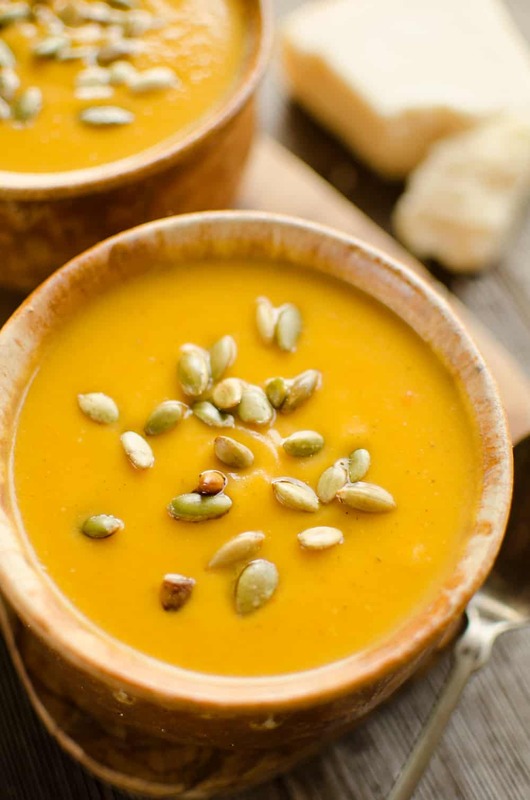 As soon as the weather starts to turn at the start of fall, Butternut Squash Soup is one of my FAVORITE dishes to enjoy. 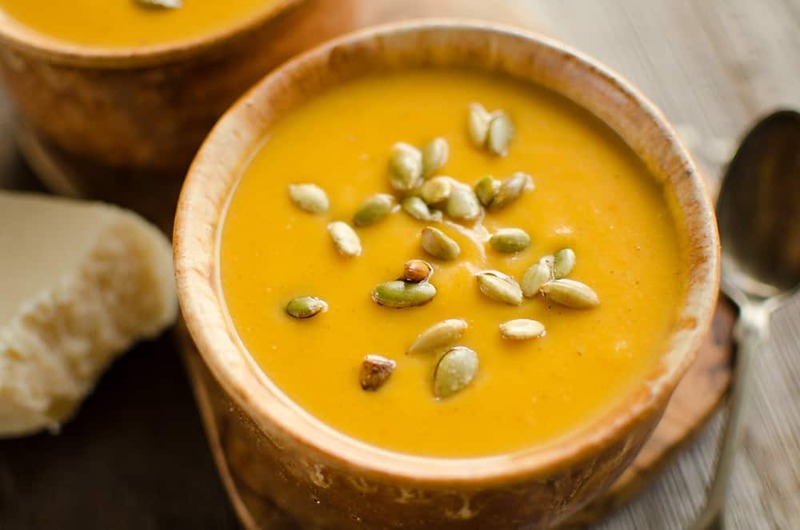 With the brisk weather sweeping into our area a couple of weeks ago, I was craving a rich and delicious bowl of this squash soup. We don’t have any nice restaurants where you can get it and the boxed stuff is always utterly disappointing. My lazy pregnant self wasn’t in the mood to roast all my vegetables up and wait for a over an hour for this Roasted Butternut Squash & Bacon Soup. It really is delicious, but I wanted something pronto. 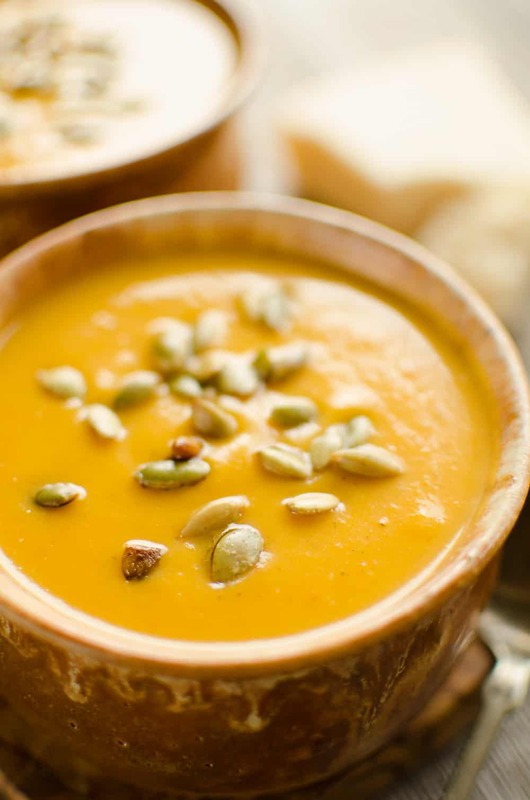 That is where my Instant Pot came into play with this Pressure Cooker Creamy Butternut Squash Soup. I quickly realized, my beloved electric pressure cooker could whip up this soup faster than any other appliance in my kitchen. I cooked up some onion, bell pepper and garlic on the saute function and added in the remaining squash, apples, spices and chicken broth. I used pre-cut butternut squash to make life even easier. Squash is one of the few vegetables I will pay a few extra bucks for the convenience of having it pre-cut. I really just don’t enjoy tackling a squash unless I have to. I placed the lid on the Instant Pot and set it for 5 minutes under pressure and the squash and veggies were perfectly cooked. I popped my Immersion Blender in the pot and began pureeing up the goodness. Once it was almost smooth and still piping hot, I added the goat cheese and Parmesan and then continued to puree it until it was velvety smooth. If you don’t have an immersion blender, which I highly recommend for tasks like this, you could transfer the mixture to a regular blender in batches to blend it. One of my favorite ways to garnish Butternut Squash Soup, apart from crispy bacon, are salty Pepitas. 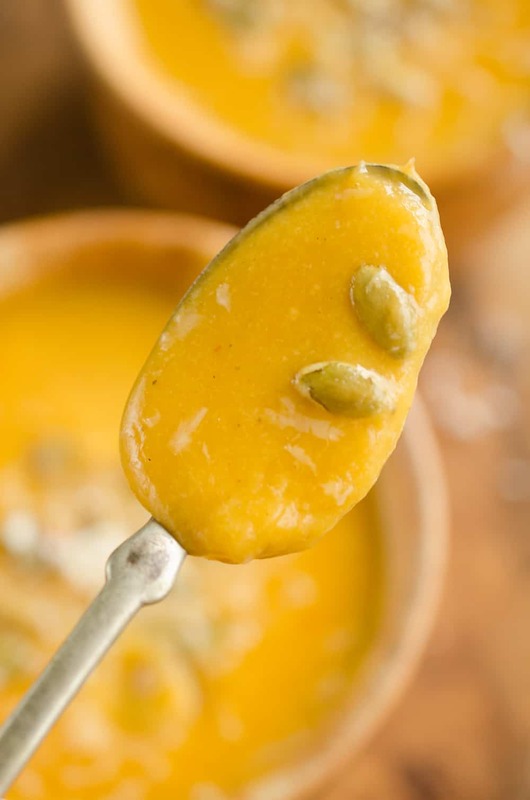 They add the perfect bite to the creamy and smooth soup for a truly amazing dish. My husband isn’t a big soup eater, much less a vegetable soup eater, so I got to enjoy every last drop of this soup all to myself! I had a big bowl for dinner and then packed it up for lunches for the week with a small bag of Pepitas. It was the perfect way to enjoy some much needed vegetables in a mouthwatering recipe throughout the week. Just looking at these photos has me craving it all over again! Turn your Instant Pot on to the Saute function. Add the olive oil, onions and bell pepper. Saute on high for 4 minutes. Add the garlic and ginger and cook for 1 minute. Add the cubed squash, apple, sage, chili powder, sea salt and chicken stock. Place the lid on your Instant Pot and move the knob to seal. Cook on high pressure for 5 minutes and do a quick release of the pressure. Using an immersion blender in the Instant Pot, puree the mixture. Add the goat cheese and Parmesan and continue pureeing until very smooth. 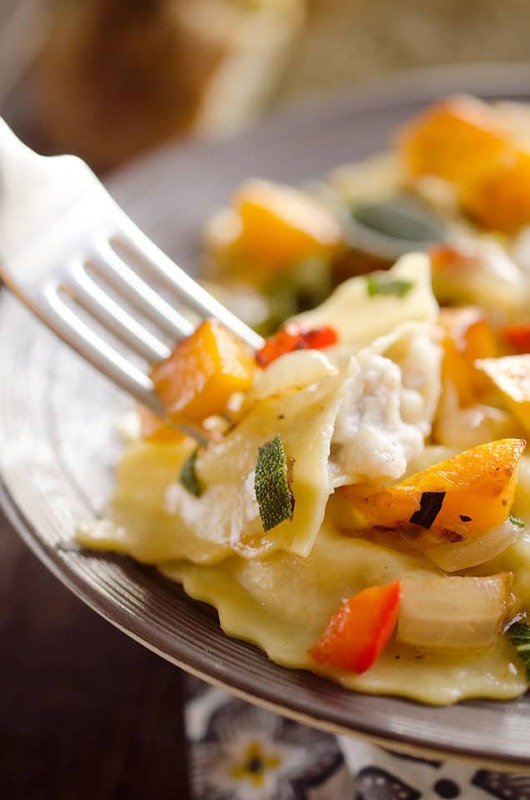 More Great Butternut Squash Recipes! Looks so hearty and flavorful, just what I need for the moment, and I like the salted pepitas you put on top! Wow! The color is gorgeous! I really need to get an instapot so I can try it. I actually just recently got my Instant Pot and have been looking for new recipes to try! Can’t wait to try this soup! I have doubled this recipe I’m my 8 quart IP. Do I have to double the cooking time? No, you shouldn’t need to increase the cook time. It will just take longer to come to pressure. Could the recipe be doubled to still fit in the 6qt?? It should double fine. I would just add the chicken broth last and fill that up to the max line in case it is too much. If there is still some remaining after you hit the max line, just add it in after it has cooked under pressure. Easily and Delicious! Used turkey broth and lots more salt and added pepper too! Delicious! I seasoned mine with ginger and cardamon, (no chili powder) it was delicious! Really excellent soup. Made it tonight and my husband and I enjoyed it so much. The goat cheese was a great addition! The goat cheese is my favorite part! Happy to hear you enjoyed it Gianniana. Great flavor and texture! 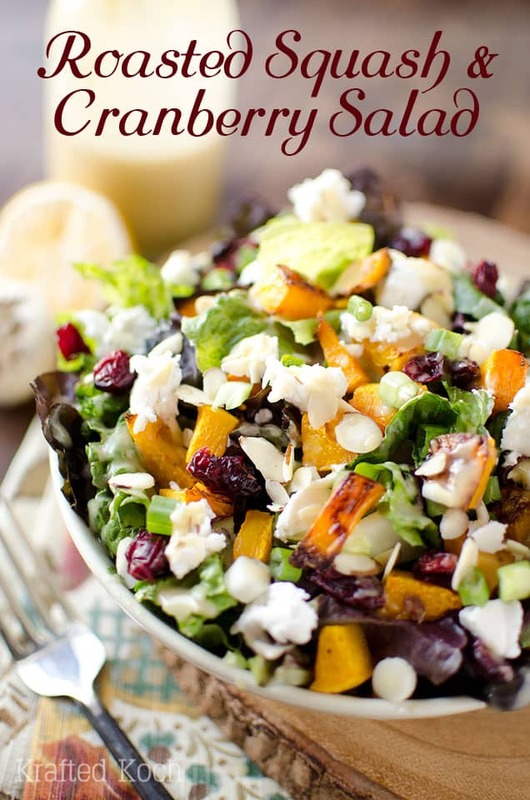 I used two smaller butternut squashes and used cream cheese instead of goat cheese – turned out perfect! I didn’t have an immersion blender so I transferred everything to a blender. It was a little extra work but the texture was amazing! I will definitely make this soup again. Thank you! I made the soup with a variety of winter squash. It as absolutely delicious 😋. Even my husbandsomdelicious and healthy for the. Great recipe….health you and delicious! What is fresh ground ginger? I have fresh ginger root and I have ground ginger. I can’t ground my fresh ginger, I can only grate and chop.. so is this saying fresh ginger or ground ginger (powder form)? Just cause powdered ground ginger takes a lot less to season than fresh and don’t want to overdo the ginger.. 1 tsp fresh ginger ginger is 1/8 tsp ground ginger.. thanks! Thanks! I made this a couple nights ago, didn’t have goat or cream cheese but had ricotta. It’s delicous! 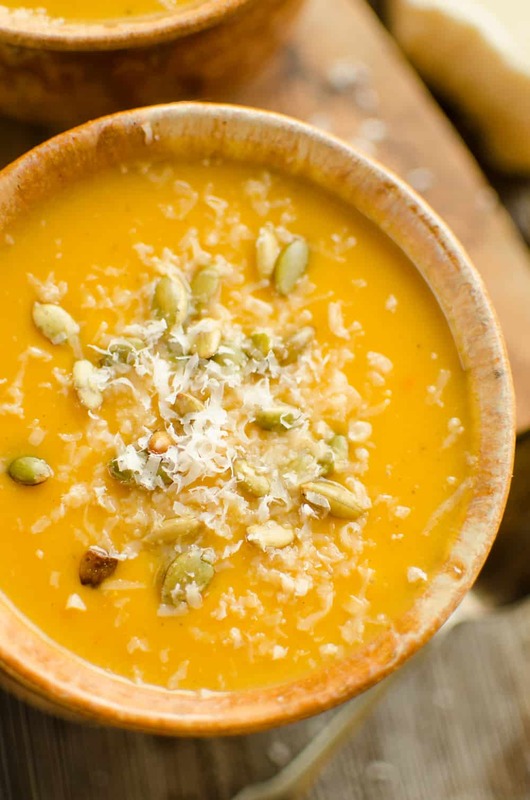 I’ve been looking for a good butternut squash soup that actually tastes like butternut squash and this is it! Happy to hear you enjoyed it Sarah! I have never commented on a blog post before but I enjoyed this soup so much I felt compelled to write. Recipe was perfect and tasted so much better than I expected. Thank you so much for sharing it! Thanks so much for the feedback Jess! It’s one of my favorite soups this time of year. The soup was fantastic. I used fresh rosemary as I did not have sage. Did not use the cream cheese. Immersion blender is worth the investment. Thanks for sharing your recipe. It’s going into my favorite soup recipes. Rosemary sounds fantastic. So glad you loved it! I have a Cuisinart, but most do a good job. Just don’t get a cordless one because they don’t have enough power. This really cooked up to be more than the sum of its parts. I started with a tsp of salt, some grinds of pepper, maybe 1/2 tsp of Mexican chili powder, a tsp of cumin, and a tsp of dried ginger. I did a natural release just to ensure the vegetables would be perfectly soft. It blended up to a very velvety texture. All in all – delightful! 1. Do you use fresh sage or the dried herb? Can I substitute with dried rosemary? 2. what kind of apple do you use? Green apple or is a red gala apple ok? I used dried rubbed sage and rosemary should work if you like that, but maybe use a little less. I usually use a red Braeburn, but any apple should work fine. Very good I did not add cheese but 1 small potatoes for thickness and 2 carrots for flavor. Turned out great I will be making this again super simple. This was absolutely decadent. My non-soup loving husband told me it is one of the best things I have ever made! Best part? One pot, very little mess. So happy to hear you and your husband loved it Amy! Delicious and super easy – thanks! I substituted a jalapeno pepper for the bell pepper because that’s what I had on hand. Is it frozen cubed butternut squash that you use? Where do you buy it? Thank you! No, I used fresh squash. When I am lazy, I buy it pre-cut in the deli section. Just finished making this. Pretty much stuck to the recipe except for the addition of a carrot because I got two recipes mixed up in my head. Oh well still tasted great. I even roasted up some pumpkin seeds to sprinkle on the top. That worked really well thanks so much. It will now become a favorite. It was excellent. I made it today for Canadian Thanksgiving. I made a vegan version by adding coconut milk – unsweetened instead of the cream cheese. I made this last night. It was delicious! The hard part is dicing raw butternut squash, but it was well worth the effort in the end. My husband is allergic to onions, so I left that out. I didn’t have fresh ginger so I used powdered. Cayenne instead of chilli powder. Despite my substitutions, it still turned out great. It’s a very flexible recipe! Has anyone frozen this soup? I have and it’s great reheated! Hi, I am going to cook this with my 8 qt Instant Pot, will everything be ok? Just made it; just had it….delicious! Thank you! Looking forward to trying this. I bought so cubed butter nut before Chrstimas- def. going on my menu this week. Danielle, thanks! Very gentle soup turned out. Very cool photos! Hi I was wondering how many quarts does this make? Is the 4-6 servings cups? Thank you! Going to make it this weekend. It sounds AMAZING!